Get the latest information on Catalina Foothills home sales in 1 minute. Right Here! See the Foothills Homes Sales August 2018 update for Single Family Residence (SFR). Our Catalina Foothills home sales report includes all Tucson subdivisions in the Foothills. Want more? See our Tucson Housing Report. It covers real estate activity in the greater Tucson AZ area. This quick update on Catalina Foothills Homes sales August 2018 summarizes the real estate activity in this sought after area of Tucson AZ. The Foothills area is home to the Catalina Foothills High School. The “District 16” High School is one of the top high schools in Arizona. The Catalina Foothills boundaries are River Road to the south. Oracle Road to the west. Sabino Canyon Road to the east. The Santa Catalina Mountains and Coronado National Forest border the Foothills to the north. Just click the link below to view December’s Single Family Residences activity. The history of the Catalina Foothills began in the early 1920’s. The Catalina Foothills area was federal trust land. Residential property development began north of River Road. en new housing subdivisions sprang up almost overnight. Early subdivisions offered large lots and low-density residential living. Good fortune came to these first residential developments. Josias Joesler. Joesler arrived in America in the late 1920’s from Switzerland. He had been a successful architect there, but wanted new challenges. Joesler designed many of the homes in these neighborhoods in the 1930’s. He went on to design many of the homes throughout the Catalina Foothills. A “Joesler” home is a sought after and treasured home in the Foothills. The Catalina Foothills has a population of over 50,000. Most subdivisions are low-density, giving them a rural character. The Catalina Foothills have some of Tucson’s most impressive homes. Tucson City lights and mountain views abound. 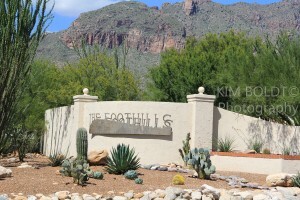 The Catalina Foothills is where some of the most high-priced homes and lots can be found. The “Foothills” has the highest median home value in Tucson. The Catalina Foothills School District began about this same time. CFSD’s first facility was at East River Road and North Campbell Avenue. That building continues in service as a CFSD’s administration facility. Catalina Foothills High School is south of Skyline Drive and west of Swan Road. CFSD is a top school in Tucson and Arizona. The Catalina Foothills residents founded the Skyline Country Club in 1963. Skyline Country Club is one of the Foothills private clubs. La Encantada opened in 2005 and brought high-end retail shopping to Tucson. It is in the Catalina Foothills on the northwest corner of Skyline and Campbell Avenue. The Catalina Foothills provide world class accommodations. Hacienda del Sol, Westin La Paloma, and Loews Ventana Canyon. The world famous Canyon Ranch Resort is nearby. This Catalina Foothills homes sales report is one of our nine monthly reports. Get the latest on Tucson real estate sales right here. And if you are looking for a Catalina Foothills home OR condo for a winter getaway? We can help! Considering A Foothills Home In Tucson, AZ? Why? We want you to know what to expect. And what to plan for. This Foothills Homes Sales August 2018 report will get you up to speed on the Catalina Foothills real estate market. Our Foothills Homes Sales August 2018 report will show you what’s happening in theCatalina Foothills real estate market. But, selling a home requires more than listing it in the Tucson MLS system. It’s about marketing. Marketing through multiple online channels.